Qucksilver DJ is a mobile enertainment company which DJ’s weddings, parties, bar events, and more for the Iowa area. 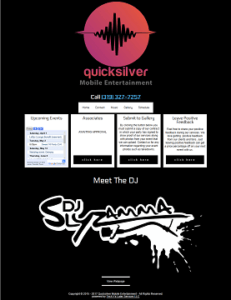 The Quicksilver DJ website was built to be fully responsive to any device or browser its viewed from and was designed according to the company’s specifications. They utilize our content management system for easy modification of website content, slideshow image upload, and gallery image upload.